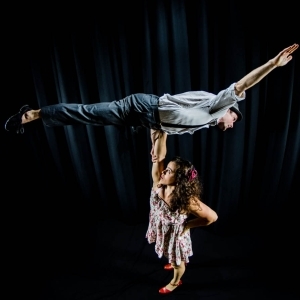 Retro Verso (aka Terry Crane & Erica Rubinstein) is a genre and gender challenging partner acrobatics duet that flips our preconceptions on their head. Terry is a professional circus artist performing vertical rope, Cyr wheel, and partner acrobatics. Alumnus of the National Circus School of Montreal, and veteran performer of 15 countries, he is also Seattle native. Erica directs two youth performance companies at the School of Acrobatics and New Circus Arts in Seattle. She has performed all around the Seattle area and most recently for Circus Bella in San Francisco.